Here's a photo of the Hartford Connecticut USA skyline. I took it from the top level of the Aetna parking garage. The tallest building is City Place, a few buildings to the right is the Travelers Tower, way to the right is the Connecticut state capitol building, the highway is Interstate 84. Please feel free to add a photo to the comments or create another post showing "Where we live and work". Here's the view from the CA Islandia, NY office. Great view and its great to see all the ducks swimming in the pond throughout the day. Love going for walks around the building and taking in the scenery. What a beautiful picture, Phil! That's a great view to have from work everyday! I currently live on Long Island, but I'm a Jersey girl at heart. So, in honor of my home state, may I present you a picture of the greatest breakfast food of all time (pork roll, egg and cheese sandwich) on the beach in one of my favorite places in the world, Seaside Park, NJ. And for my current roots, a picture of my favorite park near my house, overlooking the Long Island sound. 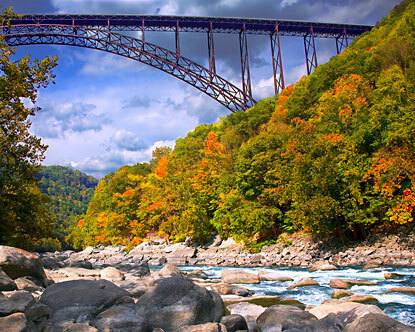 This is the New River Gorge Bridge - the longest single-span steel arch bridge in the western hemisphere, and the third tallest bridge in the US (876 feet above the river). The highway is closed for one Saturday in October for "Bridge Day," where people come from all over the world to BASE jump - either by jumping or by using a catapult - into the Gorge. This is why West Virginia is called Wild and Wonderful! Come on over and visit! Who knew West Virginians were so adventurous!!! That first picture is gorgeous - love the autumn colors! I was born, raised and educated in and near Pittsburgh, PA, but moved to Long Island almost 20 years ago. There are things I don't like, but man, being surrounded by water and having easy access to New York City sure are nice. This first picture is my son fishing for striped bass in the Atlantic Ocean last week (he caught one). This picture is of our local beach on Long Island Sound. Hard to complain about having this less than a mile from my front door. Blue Cross Blue Shield of Tennessee is the headquarters of the Tennessee "Blues" plan located in Chattanooga. We have a georgeous campus. While this picture is of our courtyard, the external views of the city and the Tennessee River are truly breathtaking. We are so spoiled here that we take it for granted! Thanks for the wonderful pictures and comments! It's really cool to see all these awesome places. Wow - excellent picture of Hartford Phil!